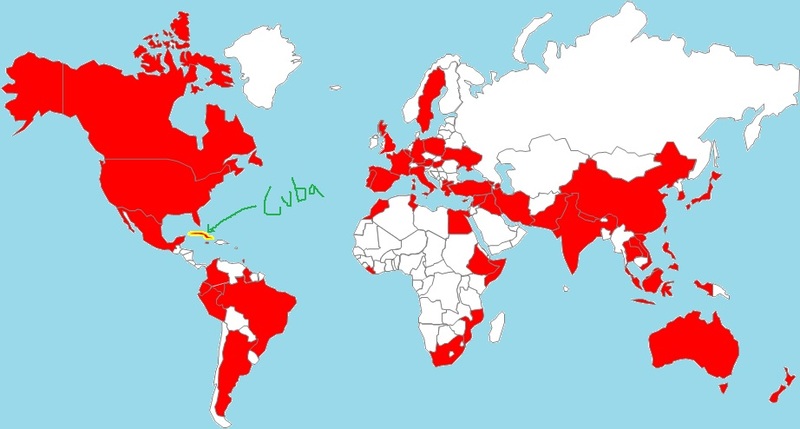 The Cuban | Restaurants of the World Unite! Everyone seems to be caught up and in the romance and drama of the football World Cup at the moment, and I must confess that I too feel pangs of excitement. Not because of the spectacle you understand (there are too many goals – what happened to the art of defending? ), but because I know what it is to participate in elite athletic competition. Having stepped out as left-fielder for the Brussels Kangaroos Men’s Fastpitch Softball Reserve Team and won the league two years in a row before retiring undefeated (apart from that first season), when I see soccerers strain and exert themselves under such phenomenal psychological and physical pressure I’m instantly transported back to that time when I almost caught/stopped/saw that ball. Phew, that was a squeaker. I was so close but Dr Edelstein says that I was right not to risk trying to catch that ball with my potentially low bone-density. My team mates didn’t seem persuaded by his note, but I think they silently applauded every time I pulled on my number 9 jersey when no one else had turned up. 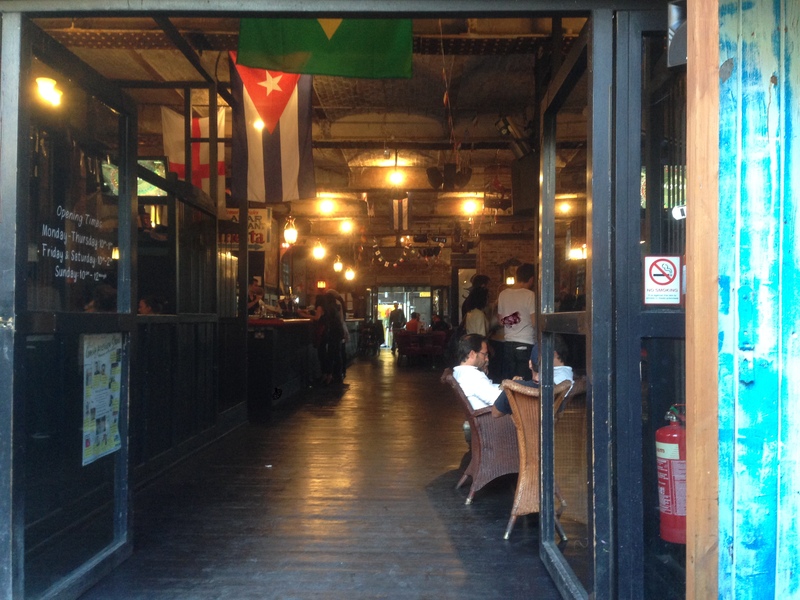 It comes as no surprise that soccerball is stinking up virtually every hostelry and so it was in The Cuban (http://www.thecuban.co.uk/) as our former foes Argentina and Switzerland squared off against one another. My sister Dangles joined me and we caught up over a tall, cool Palma Cristal beer. 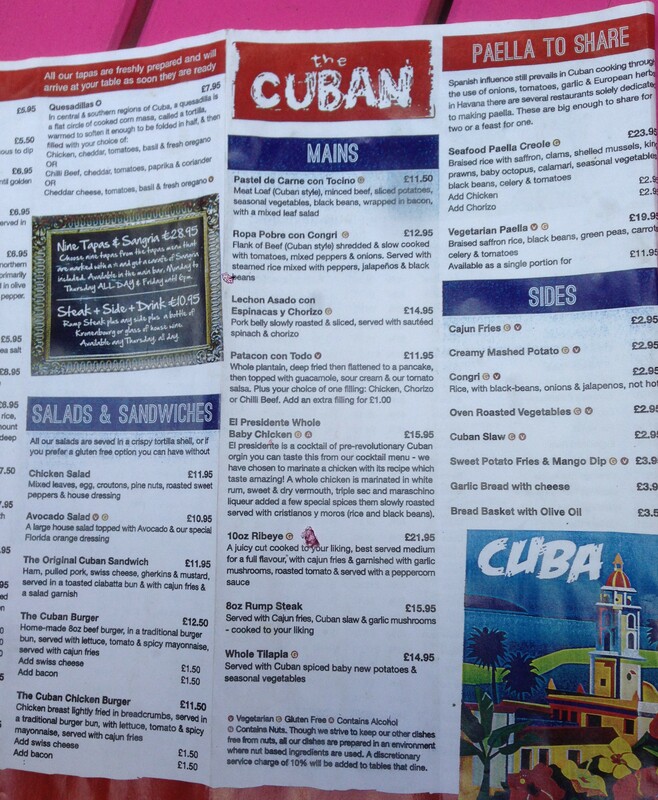 The Cuban has the run down feel of how I imagine Cuba to actually be, though with fewer people jailed for dissent. Patchy paint work, the flag and I’m guessing pictures of Che Guevara and Fidel Castro adorn the place and it has a cavernous, barn-like feel. I liked it. The food arrived in short-order. Dangles ordered the Patacon con Todo, a flattened plantain pancake heaving with chicken and peppers served with guacamole, salsa and sour cream and I had the Lechon Asado con Espinacas y Chorizo, pork belly in a spinach and chorizo sauce. 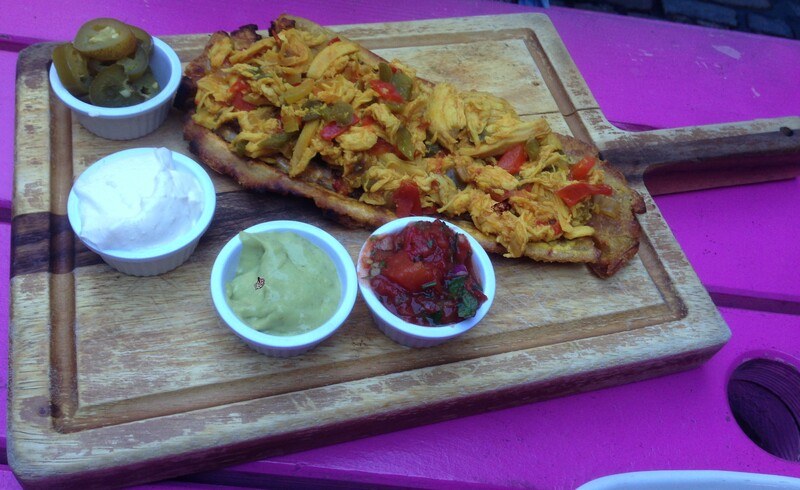 The patacon was nice enough, but could have done with some seasoning as the plantain itself lacked virtually any flavour. Some salt could have set it off nicely. The Lechon was terrific, the sauce was succulent and tangy, much like myself. 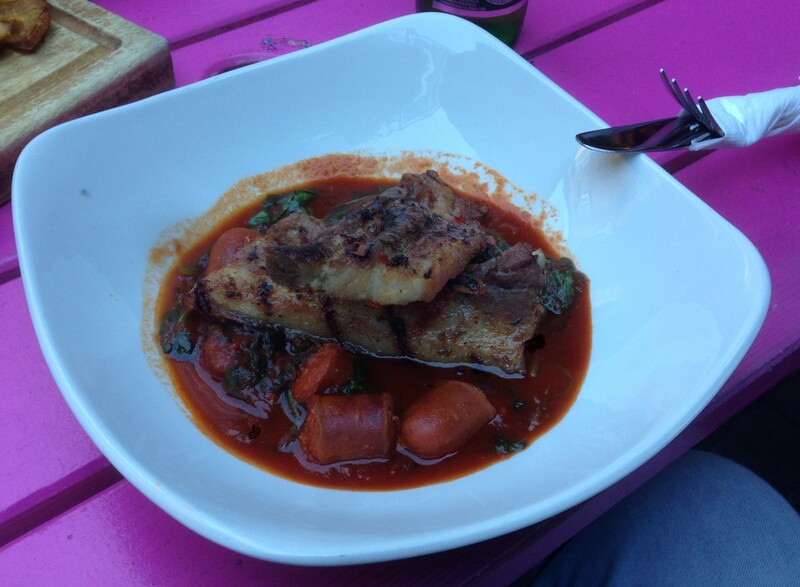 I’d serve the pork belly on the side so the charcoal grilled flesh isn’t ensogginated by the sauce. You probably need to order chips or rice with that. £35 for two people. I’d go again. 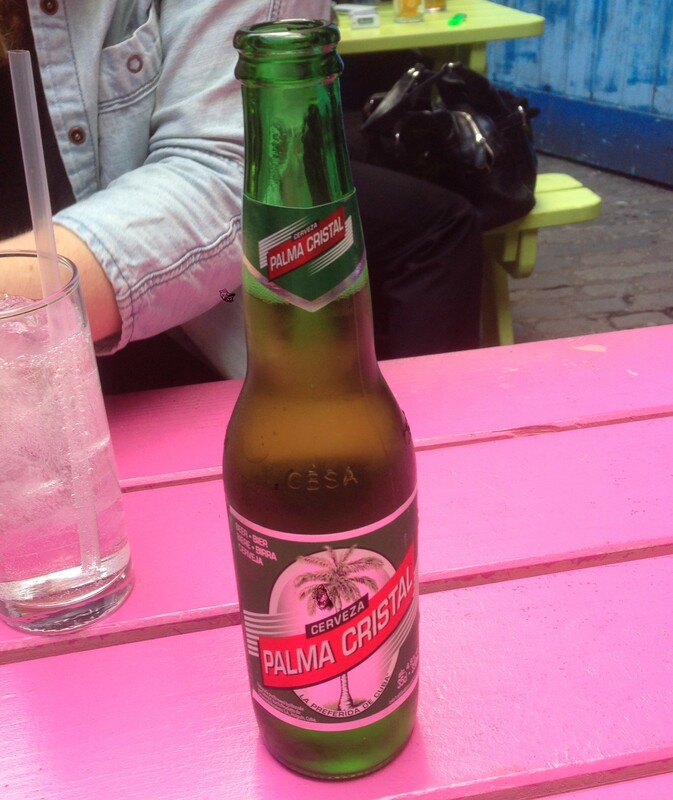 Crystal Palm Tree beer? You can’t make this stuff up. The Patacon Con Todo. Everything? Really The Cuban? I don’t see an condor eggs or jalapeños. On no wait, there they are, top-left. I take it back, The Cuban. My exhaustive analysis deems your “todo” to be just. There’s nothing chorizo cannot improve. Even pork. Now that’s a revolutionary idea Castro! Garnishing pork with pork? Now I’ve seen everything. Everyone was gawping at the football. I felt a palpable sense of relief when I switched to UK Gold for a rerun of an episode of Country File from 2010. One of my favourites, when Craven turns his spotlight of journalistic justice and laser-beam investigative focus onto the hot topic of the lesser known British berries. I must look up how many Baftas that won.